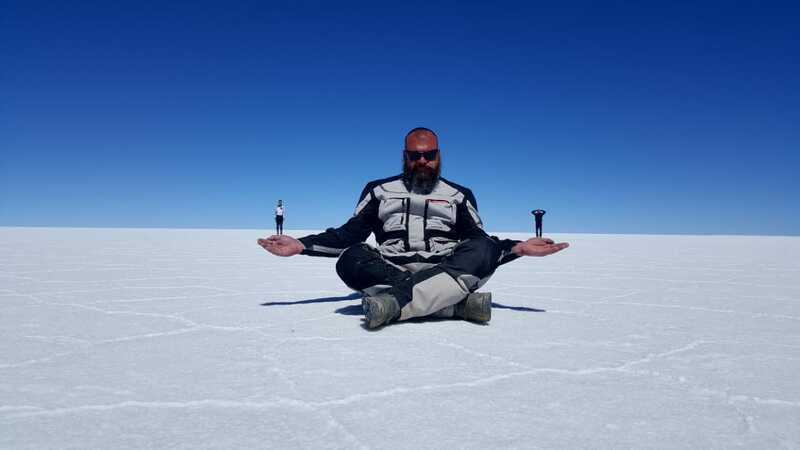 For those who want to see most of Bolivia´s highlights and ride lots of off-road, but nothing too difficult for the average motorcyclist. 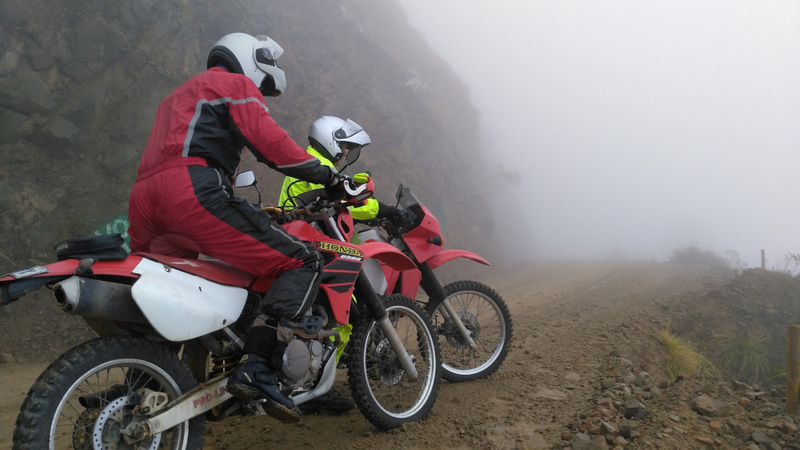 Starting with the “Ruta del Ché” we make our way to the indigenous market of Tarabuco, following to the colonial Sucre, the capital of Bolivia. 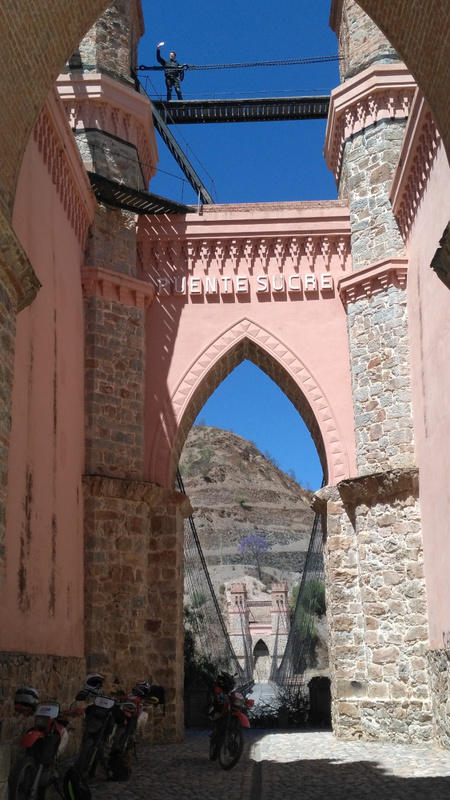 Continuing, we ascent to Potosí, the highest city in the world and the oldest operating silver mines in the world. 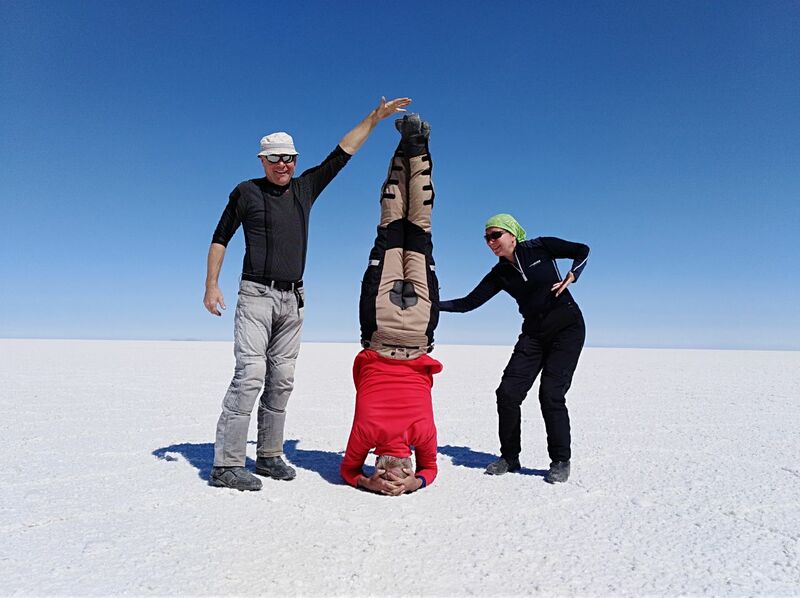 This is followed by the “Salar de Uyuni”, the largest salt-flats in the world, the train grave yard, the Dakar monument and Lake Titicaca, the highest navigable lake in the world. We try to ascent the Chacaltaya Mountain at 5.270 m altitude by bike. Including the most dangerous road in the world, the infamous “Death Road”, the coca leafs plantations, we reach the highest Christo statue in the world. Photographer get prepared for a 100 years time travel in Totora. 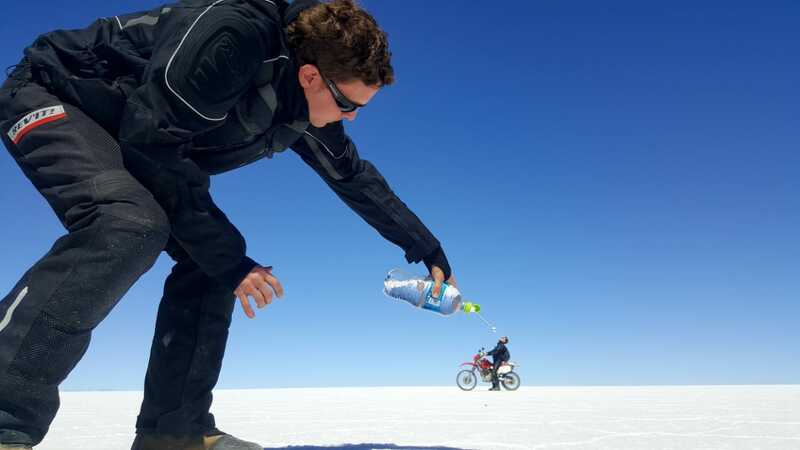 A tour filled with extremes, on a selection of the best motorcycle roads available. Highest riding peak: 5.200m resp. 4.650m. 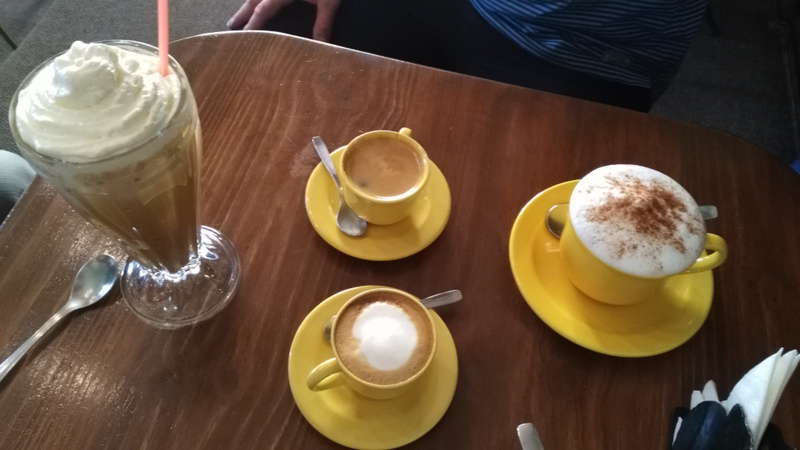 We leave Sucre after breakfast. On smooth tarmac we start to climb towards the altiplano (high planes) until we reach to a strange bridge, which we intent to ride. 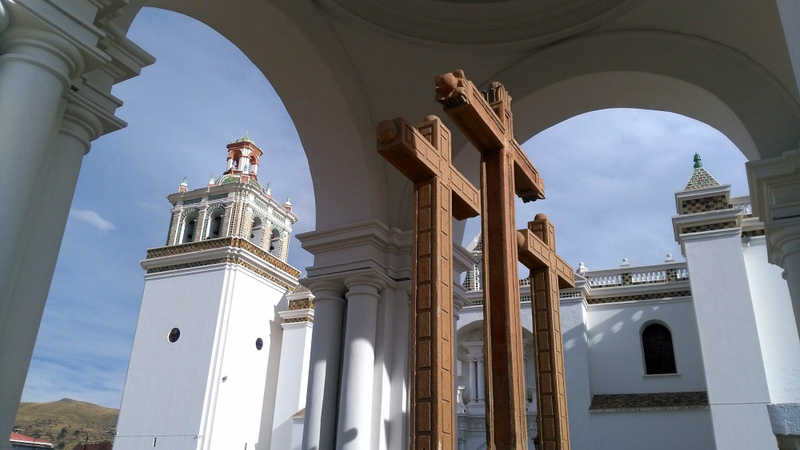 The mining city of Potosí is with 4.100 m altitude the highest city in the world and also classified Word Heritage by UNESCO. During the ascent, the guides will give us instructions about altitude sickness. In the afternoon we visit the miner’s market where we can buy anything, ranging from coca leaves to dynamite. Here we do some interesting shopping to have some “boys fun” later. In the morning we leave Uyuni behind us. Passing scenic altiplano desert landscapes and several small villages, we make our way to Oruro, famous for its markets and grill restaurants. So “grill” will be treat in the evening. 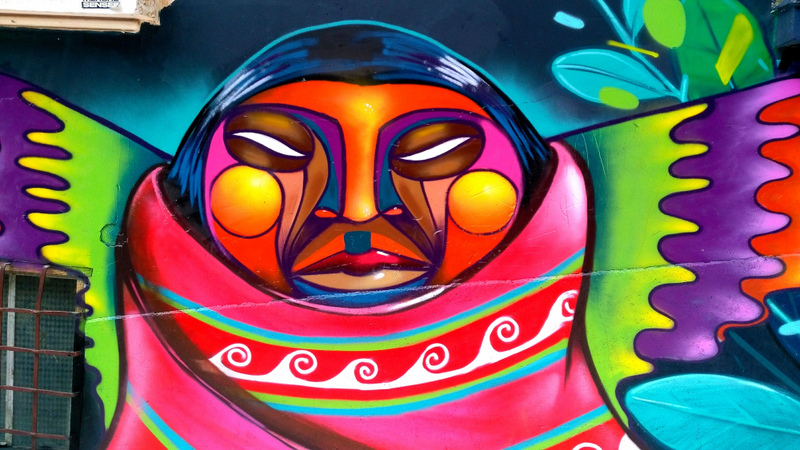 To avoid the chaotic traffic in the city of El Alto we leave Oruro early in the morning by the new built motorway. 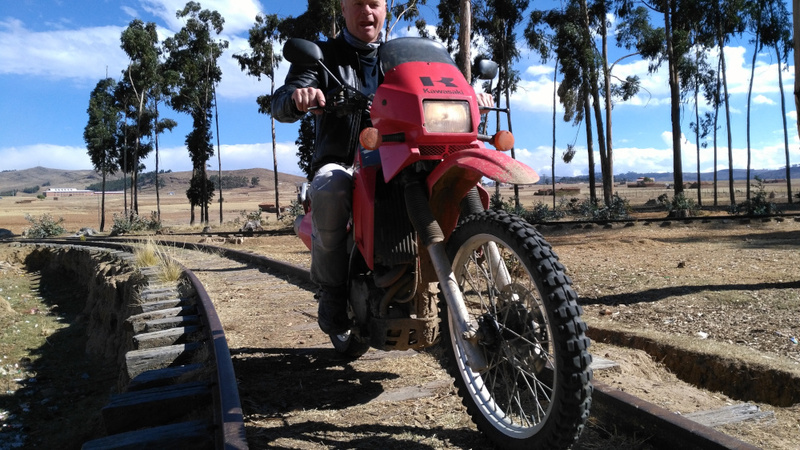 Conditional to our arrival time nearby El Alto, we evaluate to take a short cut towards Lake Titicaca. Crossing the crystal blue waters to the peninsula of famous Copacabana on a pontoon, we enjoy views of snowcapped mountains over the clear blue lake. Our hotel has a marvelous view of the lake. Guess what’s going on for dinner? 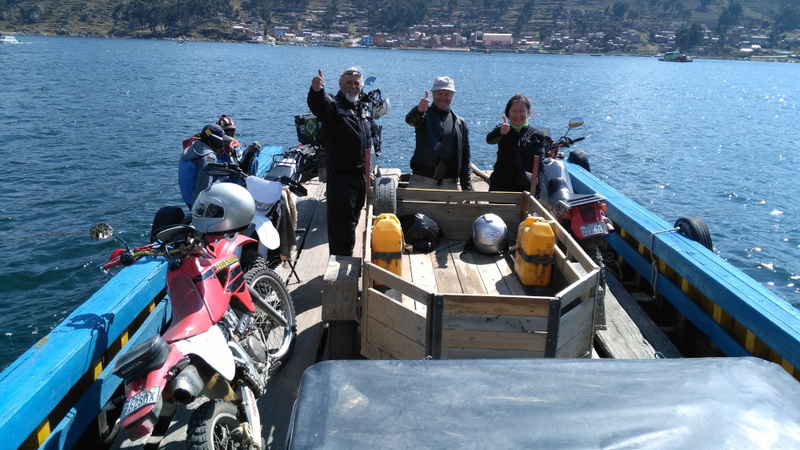 Exchanging our bikes for a boat, we visit 2 legendary islands from the Inca times. 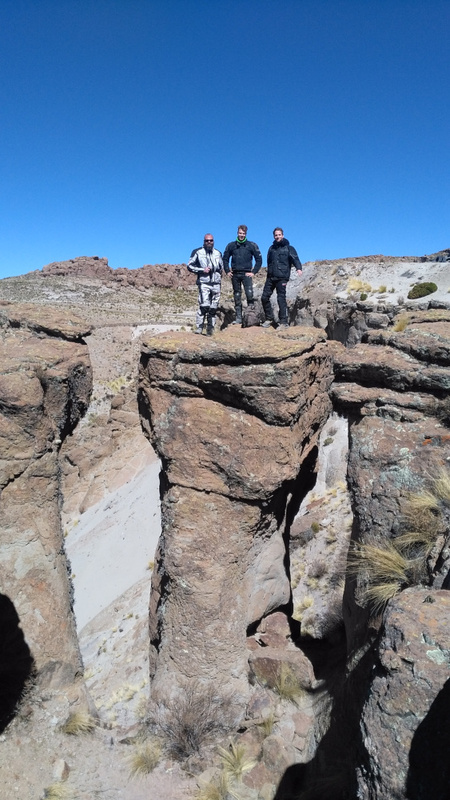 On Island of the Sun we make a short hike with fantastic views of the snow-covered mountains that border Lake Titicaca. On Island of the Moon we visit the ruins of moon virgin’s temple. 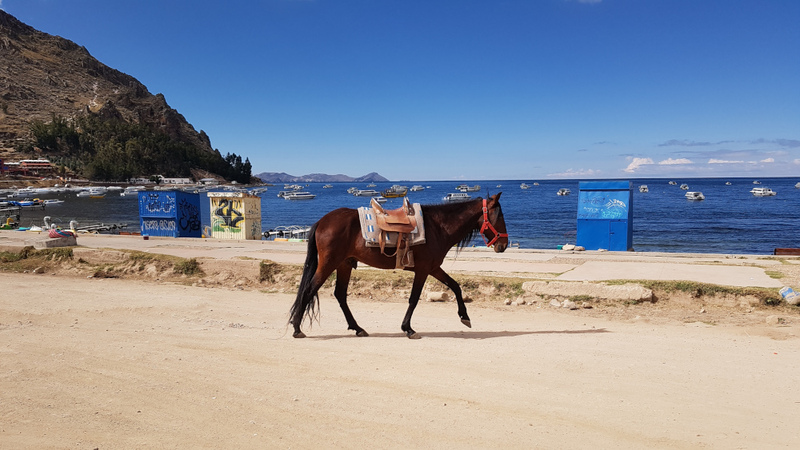 In the morning we leave lake Titicaca behind, stop at the La Paz view point and arrive in La Paz, the defacto capital of Bolivia halfway the afternoon. It is possible to visit the witches market where we could buy anything ranging from magic potions and amulets to mummified llama embryos. 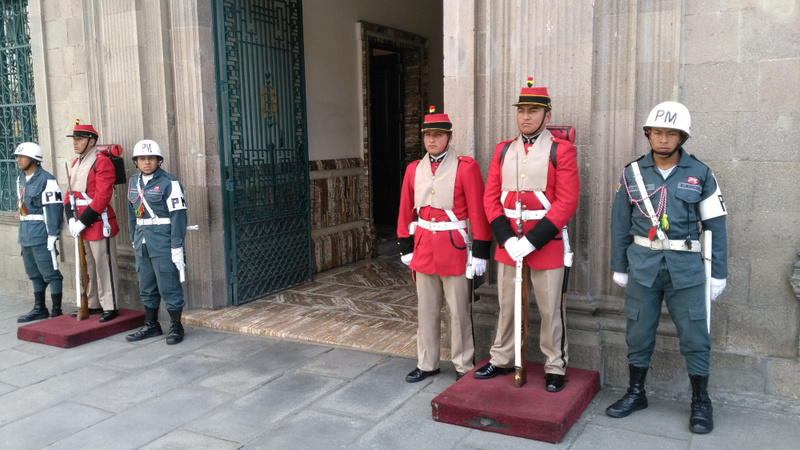 In the evening we can witness the changing of the guards at the presidential palace. 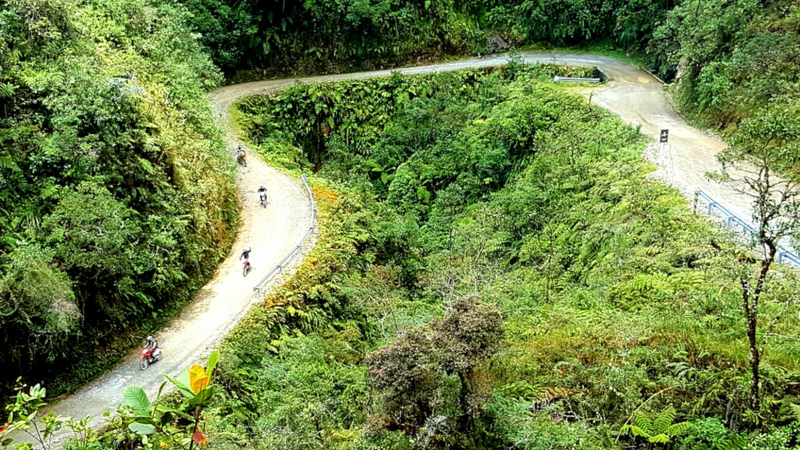 From La Paz we ride to Coroico on what was once officially the most dangerous road in the world. 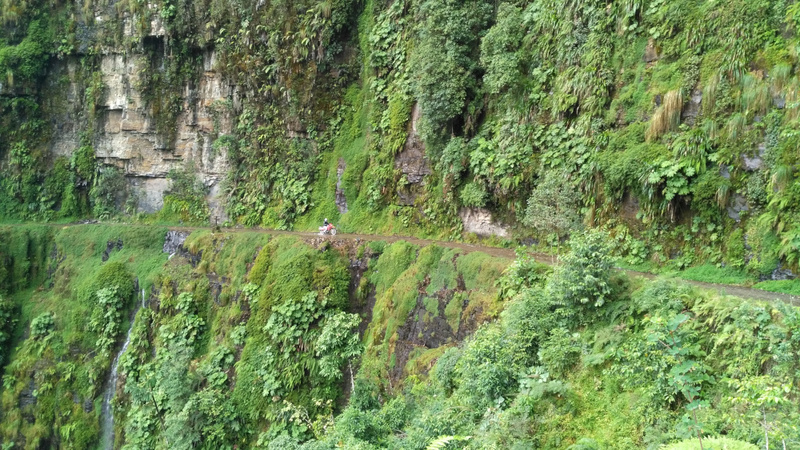 Plummeting down into the tropical Yungas region, the views are magnificent and if we keep our speed down, we have a very good chance to arrive safely in Coroico. For the really brave we finish today’s ride with a 500 m zip line adventure, siting or in spider position. From here only 45 minutes ride to the hotel´s pool. 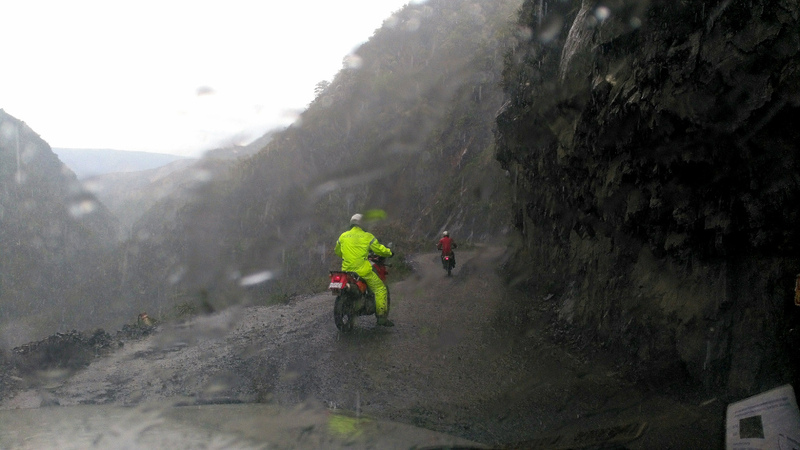 We leave Coroico and follow narrow unpaved mountain roads through the Yungas, well known for its coca leafs plantations. Passing small picturesque mountain villages and on the end, a very scenic real death road, we arrive in Chulumani around noon. Time to soak in the swimming pool, explore this bustling agronomic trade center of the Yungas or just to relax. 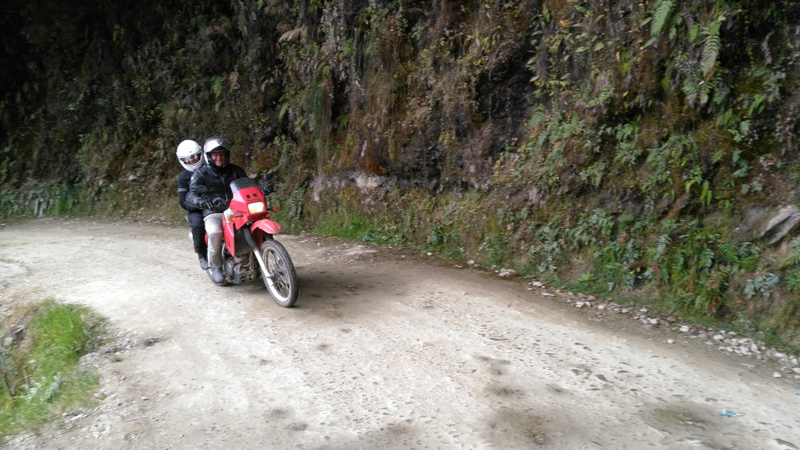 Again an entire day of narrow, unpaved roads following deep ravines, crossing rivers and passing tiny settlements. Late in the afternoon, the last hour before arriving, we ride on the edge of a small curvy gorge road with a splendid view. Quime is a small cradled mining town in between massive mountains. Our dinner and hotel are basic and very Bolivian. After a Bolivian breakfast we leave Quime. At a traditional sanctuary we sacrifice cigarettes, alcohol and of course Coca leaves to the patron saint of the place. Passing the valley of Rio Mizque, the scenery becomes one of rough and colorful mountains and the road becomes challenging. In the afternoon we arrive back in Samaipata, on a marvelous motorcycle road though the mountains. We leave our bikes behind and hurry to jump into the hotel´s pool.